North Park Seniors at the corner of Texas Street and Howard Avenue. Assemblyman Todd Gloria and Councilman Chris Ward helped celebrate Friday the opening of North Park Seniors, which is being called San Diego’s first LGBT-affirming senior housing community. Studies suggest the need for LGBT-friendly housing continues to outpace demand amid rental discrimination cases. The building at 4200 Texas Street will have 76 affordable apartments for qualified people 55 and older; seniors of all sexual orientations and gender identities will be welcome. “This community is the product of years of advocacy, hard work and collaboration between nonprofits, neighborhood leaders, elected officials and San Diego community members. We are proud to build a brighter future for all San Diego seniors with this LGBT-affirming community,” said Sue Reynolds, president and CEO of Community HousingWorks, which developed the building. 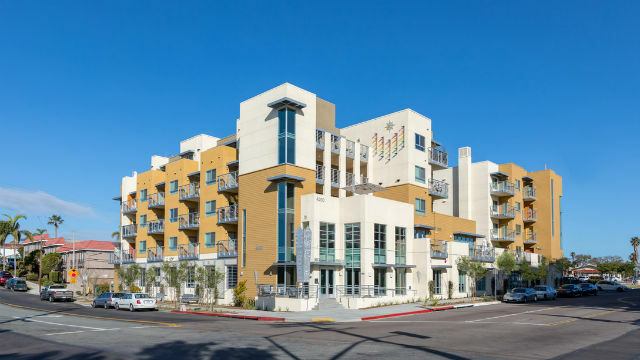 Community HousingWorks, a national affordable housing developer, built North Park Seniors in partnership with the San Diego LGBT Community Center. There are only a handful of LGBT-affirming senior communities in the U.S. The $28 million project was funded by a handful of public and private partners, including the San Diego Housing Commission.